We were the host for the second Summer Youth Series for 2016. The topic of the night was "Renewing the Mind". We had a good turnout and really appreciate all those who made the extra effort to attend. The singing, fellowship, and meal after were awesome! We would like to thank Doug Sumrall for preparing us a delicious meal of smoked brisket, barbeque sausage, smoked turkey, pinto beans, potato salad, and all the trimmings. We would also like to thank everyone who prepared a dessert and helped in the kitchen. Keri & I really appreciate the support that you give to the youth. What a fun night in Livingston, Tx! This was the first Summer Youth Series of the summer. Thanks to all the youth who attended. The fellowship, singing and lesson was awesome!! Remember the next one will be Tuesday June 28th in Palestine. I will be speaking on the subject : RENEWING THE MIND (Rom. 12:2). The Youth Group participated in the Leadership Training for Christ on March 24th and 25th. They participated in several events and brought home over 40 medals. Twenty-five of those medals were GOLD! We are extremely proud of all of our youth, and we appreciate them very much. January 24, 2016, the youth group grilled hamburgers, had a devotional and went to the bowling alley. Thanks to all of you for making it a great time! Keri and I enjoy spending time with all of you! The Crockett Road Youth have been very busy this summer. We have had numerous devos, have gone to several East Texas Churches to Youth Rallies, gone bowling, gone to Church Camp, and have even taken time to go to Lake Ioni for a day of fun, swimming and barbeque. We would like to say "Thank You" to Doug Sumerall for cooking burgers for our youth rally and for cooking the barbeque for our outing at Lake Ioni. We also want to thank Steve and Jill Camp for allowing us to use their Lake House for the Lake Ioni trip. We really appreciate all that everyone does for the Youth. The Crockett Road Youth Group participated in the East Texas Church of Christ Summer Youth Rallies this year. We were so happy that we were able to host one of the youth rallies. We had 132 in attendance and were very happy to see friends that we had met in various Churches of Christ throughout East Texas. 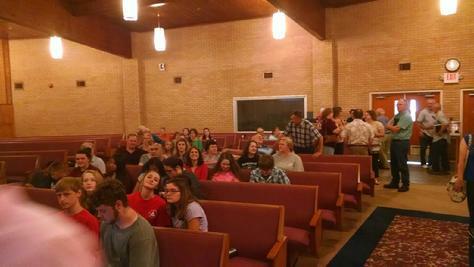 At left, are some pictures of the youth rally that was held at Crockett Road Church of Christ. We would like to thank Doug Sumerall and his daughter and son-in-law for providing and cooking the hamburgers for everyone in attendance. 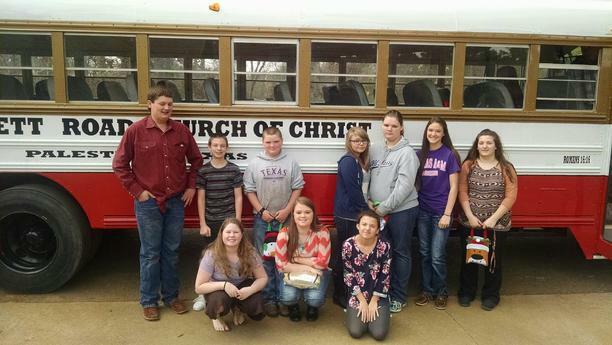 The Crockett Road Youth Group had their January 18, 2015 devo after the morning worship service. Billy Lane cooked hamburgers for the group, and then they went bowling. Everyone had a lot of fun. If you know of a teen who would like to attend the devos, please tell them that we would like them to join us. On December 14, 2014, the youth group made fruit baskets for the elderly who are shut in. The picture to the left are of those in the youth group who helped make and deliver the fruit baskets. The pictures to the left are pictures that were taken at the Youth Group Christmas Party which was held at Ben & Keri Rhone's house. There were a lot of laughs and everyone had a great time. At the devo on November 26, 2014, the youth celebrated Luke Lane's birthday with a delicious meal of home made chicken spaghetti. After that, they put their artistic talents to use as they made animals out of bananas. The pictures to the left are a few pictures from that devo. (We would like to thank Jill Camp and Keri Rhone for making the spaghetti). The youth would like to say thanks, to our heroes, for serving our country. On Wednesday, October 29th, the youth group had a meal and a devotional before loading up on the church bus and going to Tyler. Once there, they went thru a haunted house that depicted what hell is like. The haunted house was called the "Hell House" and made quite an impression on everyone. Thanks to everyone who came to the DEVO Wednesday. The Youth Group went to the Texas Ranger's Baseball game on August 15, 2014 and had a great time. Photos on the left are some of the pictures from the game. If you aren't participating in the youth group, then you are missing out!!! Come join us. On August 2, 2014, the Devo was held after the morning worship service. We had pizza and then everyone went bowling. The picture to the left is some of those who attended the devo and the bowling afterwards. If you have not been attending the devos, you are missing out. We want to encourage you to come and have fun with us. Ben & Keri Rhone took some of the Crockett Road youth group with them to the Ark La Tex Encampment in Louisianna for Church Camp. There were were a total of 49 that attended the camp, and Ben said that everyone had a great time. There were several baptisms as well as a lot of new friends made. Congratulations to our Youth that won awards at the 2014 LTC competition. We are proud of you! Pictured from left to right are Elvin, Destiny, Alyssa, Ashton & Luke. The Youth Group would like to say "Thank You" to J.B. and Joyce Matlock for treating the youth group for CiCi's pizza after Church on May 25th. We really appreciate the Matlock's for their generosity to the youth of the Church. The youth had a Wednesday night devo on May 14, 2014. They had 15 youth that ate whataburgers, played games and celebrated Ashton's birthday. Everyone had a great time. If you are a teen who is looking for something to do, why not come to a devo? The youth met after the morning worship service at the home of David and Jennifer Sparks. Mr. & Mrs. Sparks fed us a wonderful meal of Lasagna. We really appreciate them for going to the effort of providing the meal for the youth and for opening up their home to us. We had a great time there and then went to Dogwood Junction for more fun! The youth met before the Wednesday night service for a devotional and food and fun! After the lesson, they were able to have some fun together. The Church is so fortunate to have a youth group that enjoy doing things together. If you are a young person ( or if you know of one) who would like to enjoy doing things with other Christians, check out the youth calendar for upcoming devos and events. There were about 50 people that stayed after Church Sunday night to play volleyball with the youth group and enjoy fellowship with one another. We had 15 youth that participated!!! Pizzas and drinks were provided by the Church. Everyone had a very good time. It is good to see so many people support the youth group and their activities. The youth met after morning services on April 6, 2014 to work on their LTC projects. To the left, are a few pictures of some of our youth along with their projects. We are proud of our youth and wish them Good Luck at LTC. The Youth Group had hamburgers and hot dogs after the morning services. After the meal, they went bowling. Everyone had a great time. If you know of any teens that are not attending the devos, please encourage them to attend. They will be glad they did! The Youth Group had a devo before the Wednesday night services. After a lesson from Ben, they ate pizza and played games. We love our teens and are so happy to have them in our church family. There were about 75 people that stayed after Church Sunday night to play volleyball with the youth group and enjoy fellowship with one another. Pizzas and drinks were provided by the Church. Everyone had a very good time. It was almost 10pm by the time the last of them were leaving. The youth group had a busy day. After the morning worship service, they had a devo and went bowling afterwards. Ben really appreciates the youth and all those that are supportive of them. The Youth and adult volleyball game was just great, & everyone had a wonderful time. We had about 40 present for the evening and all present were so excited that they want to have a replay again soon. The Pizza and other foods were great. Everyone left about 9 P.M. It was truly a fun time. The youth were great and invited several friends to come play as well. The pictures at the left were taken on January 19, 2014 at our Hamburger Luncheon after the morning worship service. We want to thank Billy and Amanda Lane for hosting the devo and for providing and cooking the hamburgers. To enlarge a picture, just click on it.